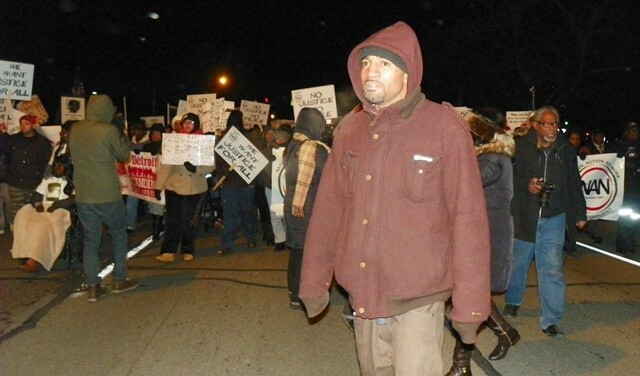 Dearborn, MI—Led by the family of Kevin Matthews, 35, slaughtered by a white Dearborn cop Dec. 23, hundreds blocked streets in Dearborn for two hours Jan. 4. VOD videographer Kenneth Snodgrass raised the chant of “Boycott Dearborn” during a rally at the end on the march on Michigan Avenue across from the Dearborn police station. It was taken up by the crowd and then by the Matthews family and march sponsors. A breakaway group called out “Freedom, freedom—racist killer police—we don’t need ‘em need ‘em,” as they blocked traffic from Greenfield onto Michigan at the end of the march. They later invaded the Kroger’s store at the intersection, and continued their chants. Kevin Matthews’ family, including his mother Valerie Johnson, sisters Kimberly and Karen Matthews, and brother Lavell Matthews, joined dozens of other relatives to lead the march, called by the Michigan Chapter of the National Action Network. 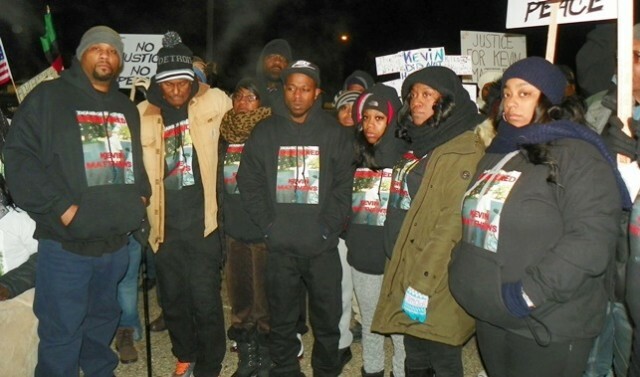 Wearing sweatshirts declaring, “Dearborn Police Murdered Kevin Matthews,” they demanded charges be brought against the cop who slaughtered their loved one. The Detroit police have said they are investigating, but Detroit police chief James Craig has issued no statement on the matter. Both Detroit and Dearborn police have refused to release the cop’s name, while continuing to besmirch Matthews’ name with unfounded reports. 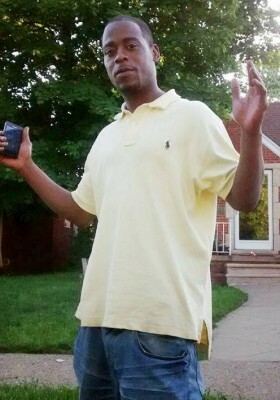 The cop, who had been on the Dearborn force for five years, crossed the border from Dearborn into Detroit, chased Matthews on foot out of range of his car’s dashcam video, then shot him at least six times to death in the backyard of a home on Whitcomb near Greenfield and Tireman. The mainstream media has reported, as in the Channel 7 video below, first that Matthews had a record of minor misdemeanors and/or warrant, then that he committed an alleged “larceny” they said he committed the day of his death, with no details provided. Neither police force has given a reason for chasing an unarmed man related to alleged misdemeanors. They have claimed Matthews struggled to get the cop’s gun. “The standard cover police use is ‘He went for my gun, I feared for my life.’ Was the chase [for alleged misdemeanors] even necessary?” Sam Riddle, Michigan Political Director of the National Action Network, told MLive at the protest Jan. 4. Statistics show that Black men have ample reason to run from Dearborn police. Residents near the border street of Tireman know to watch out for the police there, an apartment dweller on Tireman near Greenfield told VOD. 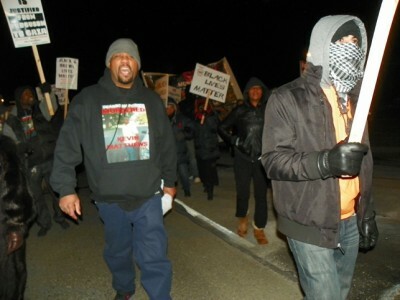 Marcher: Dearborn police murdered Kevin Matthews. Dearborn was founded by Nazi sympathizer Henry Ford I as a bedroom community for white Ford autoworkers, while neighboring Inkster was planned to house Black autoworkers migrating from the South. 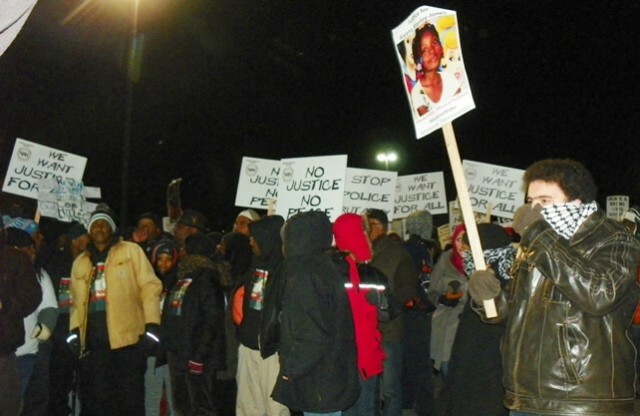 Marchers remembered Aiyana Jones, 7, shot to death by Detroit police May 16, 2010. The Detroit suburb has a long history of racist killings, assaults and arrests of Blacks. In 2000, security guards at Lord & Taylor’s in Dearborn’s Fairlane Mall choked Frederick Finley, a 32-year-old Detroit father of three, to death. They had pursued him for allegedly shoplifting $4 worth of merchandise. 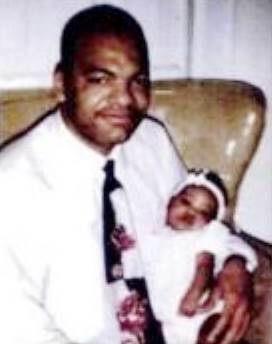 Fredrick Finley, choked to death by Dearborn Fairlane Mall guards in 2000. Ernest Griglen lingered in coma for months prior to his death after 2008 beating by Dearborn cops. After a rally of 10,000 in the store’s parking lot, the National Action Network called for a boycott of the city’s businesses. Guard Dennis Richardson was charged with involuntary manslaughter, but the case was dismissed three times, by district, appeals, and the state Supreme Court. Imam Luqman Abdullah with grandson before 2009 execution by Dearborn police, FBI. 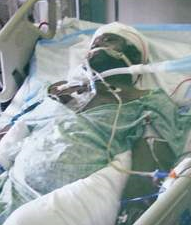 Terry Jones after 2012 beating by Dearborn cops, injured for life. Griglen spent 11 months in a coma before dying in 2009, from bleeding in his brain, caused by “blunt force trauma,” according to the Wayne County Medical Examiner. In 2009, Detroit police worked with Dearborn police and the FBI to assassinate Imam Luqman Abdullah, leader of a Black mosque on Detroit’s impoverished west side, shooting him 21 times inside a Dearborn warehouse. The U.S. Department of Justice, which oversees the FBI, unsurprisingly exonerated the killers. Dearborn cop gives Rev. Williams instructions on march route. Rev. 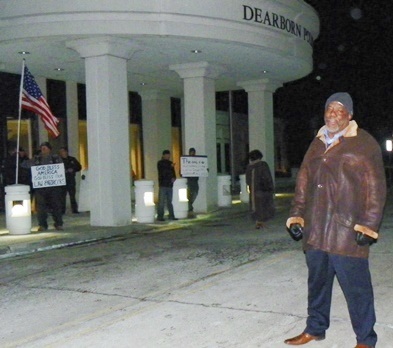 Charles Williams, the Michigan Chair of the National Action Network, promised during the Christmas Eve press conference that his group planned to shut Dearborn down Jan. 4 as protesters did in Chicago over the death of Laquan McDonald, 16. 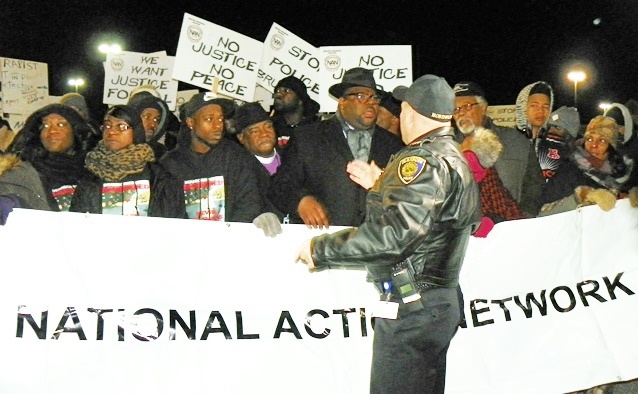 However, the NAN march was directly coordinated with Dearborn police, unlike actions in Chicago, Baltimore, Ferguson, New York City, Oakland, CA, and elsewhere. A Dearborn officer was heard explaining the planned march route to Rev. Williams in the Kroger’s parking lot before it took off. Dearborn police conveniently blocked off traffic along the route, getting upset only when marchers veered from Michigan Avenue to the front of the Dearborn police station itself. Protesters directly in front of Dearborn Police station block signs of pro-police supporters, who were allowed to stay afterwards. There, marchers chanted militantly for 15 minutes, as white Dearborn cops began coming outside. Then alleged “activist” and former Detroit cop Tijuana Morris, and a man who identified himself as a member of the vigilante group the Detroit 300, herded the crowd away from the station to a platform set up by Williams a block away from the station. Morris is seen in the Channel 7 video below going nose-t0-nose with an older woman protester who wanted to remain, threatening her. 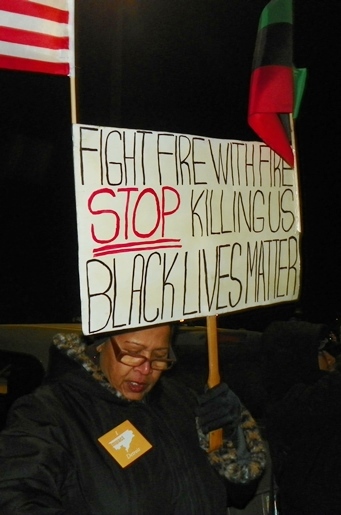 VOD has seen that protester, with her sign declaring, “Fight fire with fire,” at numerous demonstrations including marches against the police killing of 19-year-old father Terrance Kellom in June, 2015. Her photo at march is below the “Stop It! Stop It!” subtitle above. 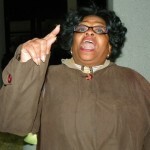 She remained and continued to shout out her outrage against the Dearborn cop murderer. Morris then proceeded to parade up and down in front of the police station to chase others away, protecting the white cops who cowered inside. The Detroit 300, originally founded by the late Angelo Henderson, Min. Malik Shabazz, and Raphael B. Johnson, have acted as enforcers FOR the police in Detroit and elsewhere. They have invaded poor Black neighborhoods searching for individuals wanted by the police, kicking doors down and intimidating witnesses. In one case, they even forcibly interrogated alleged women witnesses inside a Detroit police station. A witness has told VOD that many in the Detroit 300 are being paid through Detroit police sources. Tijuana Morris protects racist cops. Dearborn police cower inside station. Man from Detroit 300 laughs as he protects racist cops and pro-police demonstrators. Morris is seen at his left. VOD asked the man who said he was from the Detroit 300 why they are going into the poor neighborhoods and kicking down doors, rather than confronting Detroit police at their headquarters, not only for trafficking drugs, but for countenancing police murders. 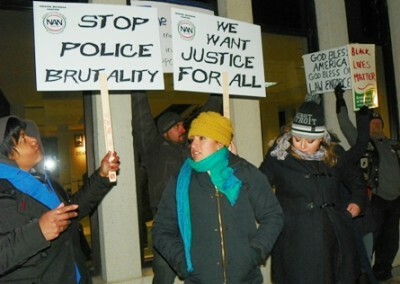 Detroit police have historically rallied to the defense of murdering cops like Larry Nevers and Walter Budzyn, who beat Malice Green to death in 1992, Eugene Brown, who killed Rodrick Carrington, Lamar Grable, and Derrick Miller in 1995, 1996, and 1999 respectively, Kevin Krupinski, who shot Errol Shaw, a deaf Detroit father holding a rake, to death in 2000, and the 18 cops including William Melendez who were indicted by the Federal government in 2003 for a years-long LA Ramparts-style rampage of assaults, frame-ups, threats and other crimes against poor residents of Detroit’s Third and Fourth Precincts. Recently, Jackson, Mississippi City Councilman Kenneth Stokes called for the Black leadership of that city to mobilize the community against marauding suburban police forces, by using rocks, bottles and other equipment similar to that used by Palestinian youth against the Israeli military occupiers of their homeland. When is Detroit going to see leaders like Councilman Stokes? SEE VIDEO BELOW. (numerous other VOD stories on Aiyana Jones, just put “Aiyana” in search engine at top). 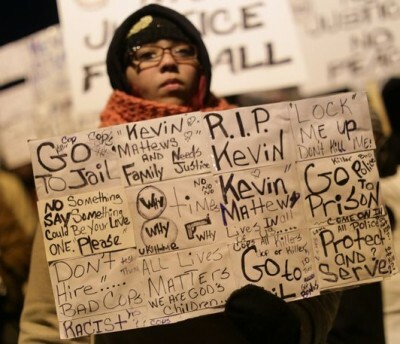 Many young people turned out to demand charges against racist cop who murdered Kevin Matthews.